Blues Point Reserve is arguably the finest place in Sydney from which to view the harbour, the bridge and the Opera House- and for that reason, Blues Point Reserve is arguably the finest place in Sydney to enjoy a picnic. Located directly opposite Blues Point Tower, the controversial (and unsightly) apartment block designed by Harry Seidler, it also offers fine views of the city’s skyscrapers, while during winter it is occasionally visited by whales. Unsurprisingly, the park is filled with revellers every time the New Year’s fireworks light up the sky. Once you’ve had enough of lazing on the grass, take the time to stroll along the foreshore. Not only will you get to see more sparkling shots of the harbour, but there’s also the chance to check out a couple of nearby landmarks: Luna Park and Kirribilli House. Although parking is available at Blues Point Reserve, spots can be tricky to find on the weekends. 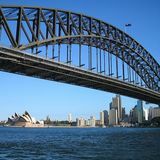 So, you might prefer to catch the train to North Sydney station, which is about a kilometre away. If you want to grab a coffee or a meal, there’s nothing at the park. However, there are plenty of options near the station.